Here is “Duopoly” in its entirety as a continuous split-screen black & white “concert video” or “full album video.” This is the video version of my album of the same name released September 30, 2016 on my own label, Pyroclastic Records. I am posting it here in full because the DVDs as manufactured (after several rounds of testing, correcting and refing) did not live up to my expectations or standards of quality. Apparently the DVD format is a big step down from digital high definition video, especially when filming black and white. Here you can watch me play continuous duets with guitarists Bill Frisell and Julian Lage, pianists Craig Taborn and Angelica Sanchez, drummers Billy Drummond and Marcus Gilmore, alto saxophonist Tim Berne and clarinetist Don Byron, in that very order on the first eight tracks and then exactly reversed order on the latter eight tracks. The album is a musical palindrome. I hope you enjoy! On a cold winter afternoon in 2014, while taking a break from mixing Save Your Breath at Ron Saint Germain’s studio in New Jersey, I took a stroll with my producer David Breskin and my young son Benjamin. Since I was in the process of just finishing my first large-group project (Infrasound), David asked the obvious question: What’s Next? As I had worked and recorded extensively in the trio and quintet formats, and also as a solo pianist, I thought that a duet project might be intriguing. Much of Duopoly was brainstormed before we got back to the studio that day. I wanted to record with people I had never recorded with before—in some cases musicians I had known well and played with, in some cases only admired. We decided to limit the instrumental palette of the guests, and to create some other simultaneously limiting / freeing rules: tightly “targeted” songs for each guest; no rehearsals before the recording; no overdubbing, no “fixing” and no mixing of the music. This all ran opposite to my normal compositional process—where I use frequent live performance to shape written material—and was an exciting change from my usual practice. The album was recorded in three days and each duo was given three hours to play a new composition (or jazz standard) and also to freely improvise a piece together. In some cases, we captured and gladly celebrated first takes; in others, more exploration was needed to find what we were looking for, and we often found something completely different and better because of that. There was reconfiguration, experimentation, exploration: these were searching dialogues. This album captures the rawness, intimacy, and immediacy of that process. Only after we finished did we structure the album in two parts: the first half features eight compositions (five by me, one by Angelica Sanchez, and two jazz standards) and the second features eight fully improvised tracks. While we thought through myriad ways of organizing the material, in the end David hit upon a symmetrical, palindromic sequence, with what he calls a “mobius twist” in the middle, where the material moves from written pieces to free improvs. The success of this sequence surprised both of us. (In some cases, the free playing sounds more “composed” than the tunes do.) Additionally, the tracks are paired by instrument, for cohesive focus and the suggestive hint (or illusion) of a “phantom duo” between each of the guitarists, pianists, drummers, and horn players. We also chose to make a visual record of the music making, which we hoped would be as live and uncompromising as the music. Shot by Mimi Chakarova with one fixed camera and one handheld, the goal was for this film to have a kind of 1:1 or indexical relationship to the music itself. There are many people to thank here, but first and foremost I want to thank Bill, Julian, Craig, Angelica, Billy, Marcus, Tim, Don. It was an incredible experience playing with these eight artists and I can’t thank them enough for their musicianship and for being open to this recording concept. 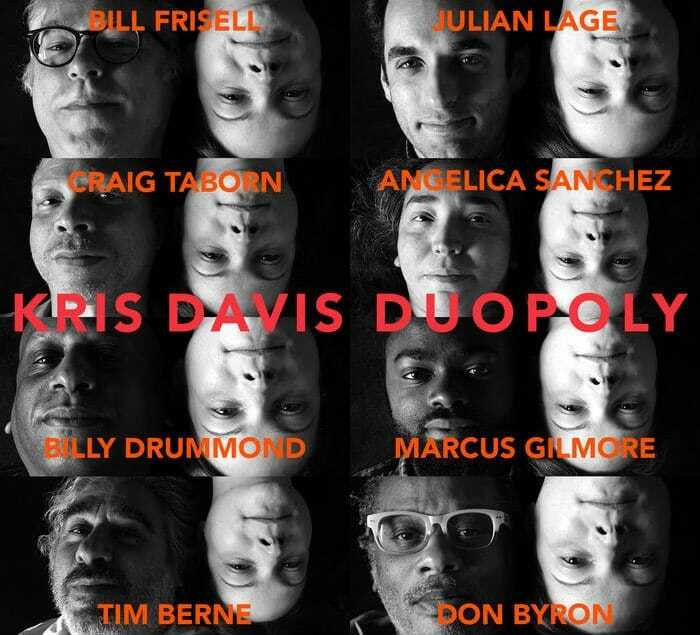 I would like to thank David Breskin, who had a vision for Duopoly from the very beginning—from the style of photography to the paired-instrument juxtapositions to the look and feel of the film. It was inspiring to see his ideas come to fruition and I am in awe of all he has accomplished here. Also, a huge thanks to my engineer Ron Saint Germain. Ron did an exceptional job capturing the essence of each duo, live-to-two-track, and reacting to what we were doing in real time. I feel so fortunate to have worked with Ron for a second album: his dedication and energy blows me away. And a BIG thanks to Mimi Chakarova for her stunning photography, videography and incredible eye. Thanks also Matt Merewitz, Roberta Findlay of Sear Sound, Stephanie Mechura, Nicole Miller, Nate Radley and Benjamin Radley. Lastly, I would like to thank Chelsea Hadley and The Shifting Foundation for their generosity and support towards the realization of this project.